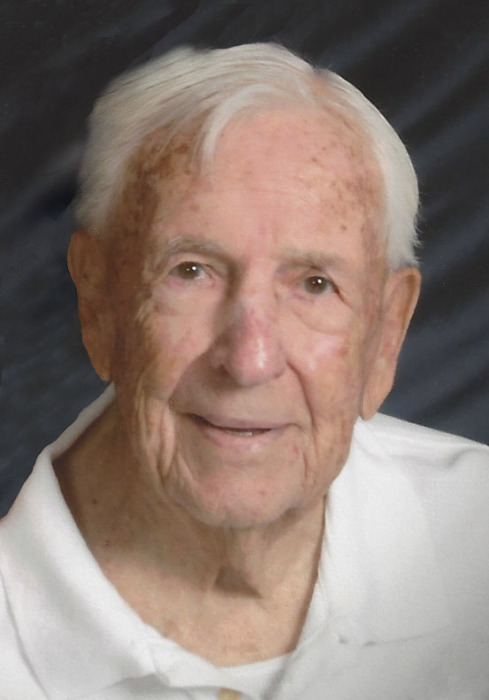 Martin Anthony Brock, 96, will be greatly missed, however, there was a party planned in heaven by “Susie”, daughter of Martin and the late Rita Brock so he left this world Thursday, August 30, 2018, to attend the party. Martin was born to the late John and Lybia Brock in Marshfield, Wisconsin. The family eventually moved to Kaukauna and then Appleton. He attended St. Therese grade school and Appleton High School. Following high school, Martin proudly served his country in World War II as a 1st Class Cook in the Navy from 9-25-42 to 12-26-45. While in World War II he earned the Good Conduct ribbon, the WWII Victory ribbon, the American Campaign ribbon and the Europe-Africa-ME (Middle Eastern) ribbon. He is a lifetime member of the Veterans of Foreign Wars (VFW). While serving in the Navy, he served in the Atlantic Ocean on the USS Melville AD-2. Martin was initiated into the Navy Organization titled “Ancient Order of the Deep” when the ship crossed over the Equator. He had the privilege of joining “The Honor Flight” to Washington DC on June 9, 2011. On June 7, 1947, he married the late Rita (Emmers) Brock at the St. Paul’s Catholic Church in Combined Locks, Wisconsin. They were married 63 years prior to Rita’s death in 2010. They were members of St. Therese Catholic Church for many years while living in Appleton. Martin built his first two homes after he married in 1947; Maple Street and Walden Avenue. In 1977 the family moved to Chain Lake in Lakewood and in 1982 to Waubee Lake in Lakewood. In 1989, the family again moved back to Appleton. Martin was devoted and immensely supportive of family and specifically to the care and entertainment of his youngest daughter, Susie. In 1940 he began working for Schaefer Dairy prior to joining the Navy during World War II. Upon his return from the Navy he returned to work at Schaefer Dairy. In June of 1948 he began his service with the Appleton Fire Department. Over the years he climbed ranks from “Driver” to “Lieutenant” and then to “Captain” before retiring on 1-10-77. In addition to his full time job, he also worked at Azco from 1959 to 1976. After retirement he volunteered at the St. Joseph Food Pantry and received an award for 5 years of dedicated service. Martin and Rita spent nights on their cruiser on Lake Winnebago and Lake Poygan. They enjoyed traveling in their RV with Susie to Alaska, Canada and throughout the United States. Martin is survived by his children: Barbara Brock-Arndt, Lakewood, WI; Tom (Marilyn) Brock, Arizona; Brenda (Mike) Wollen, Columbus, WI; and Carol (Ed) Van Lieshout, Appleton, WI; Grandchildren: Craig (Lisa) Paltz, WI, Brad Paltz, Wisconsin Rapids, WI; Amy (Bryan) Moll, Columbus, WI; Shari (Brian) Buske, Grafton, WI; Lori Wollen, Stoughton, WI; Samuel (Heather) Van Lieshout, Hortonville, WI; and Matthew (Kristen) Van Lieshout, Kronenwetter, WI; Great grandchildren: Jacob Paltz, Wisconsin Rapids, WI; Joshua Paltz, Wisconsin Rapids, WI; Kate Paltz, Neenah, WI; Emily Buske, Grafton, WI; Sarah Buske, Grafton, WI; Jacob Buske, Grafton, WI; Owen Matthew Van Lieshout, Kronenwetter, WI. Godchildren: Laura (Dictus) Tews, Kit (Rondou) Van Handel, Linda (Joosten) Hulbert and Tony Ruys; and by nieces, nephews and dear friends. Martin was preceded in death by his wife, Rita Brock; a daughter, Susie Brock; parents, John and Lybia Brock; siblings, Eugene Brock; Edna Jones; Margaret Probst; Irene Rondo; and a great grandson, Jack Paltz. A Mass of celebration for Martin’s life will be held 11:00AM Friday, September 7, 2018 at St. Therese Catholic Church, 213 E. Wisconsin Avenue, Appleton with Rev. William Hoffman officiating. Friends may pay their respects on Friday from 9:00AM until the time of service at St. Therese Catholic Church, Appleton. Burial will be in the St. Joseph Cemetery at a later date. A special thank you to the staff of Heartwood Senior Living and Asera Care Hospice.